Not being able to hunt because of my sprained ankle has afforded me the unwanted leisure of thinking about chukar hunting more than doing it. But I thought I’d share some of the thoughts just because it’s the next best thing to being on the hill with Angus. Whenever I drive anywhere near hilly terrain I’ve never explored, my first thought these days is always, “I wonder if there are any chukar up there?” Do you chukar fools do that, too? I bet you do. Too many hills, not enough time. When I look at the hills (often while I should instead be watching the road) I try to imagine what the footing is like on it. If it’s really steep I wonder how traversing the sidehill would be. I wonder if the new boots I got with a slightly narrower sole would work well up there. I wonder if the sub-freezing winter temperatures have turned the ground into cement, making it impossible to get anything resembling a level step, or if the sun has warmed up the dirt and vegetation just enough to make it pliable and more pleasant and safer to cross. Last year a friend gave me some Asolo TPS hiking boots that he’d gotten for next to nothing at an REI “Garage Sale.” They didn’t fit him but were perfect for me. 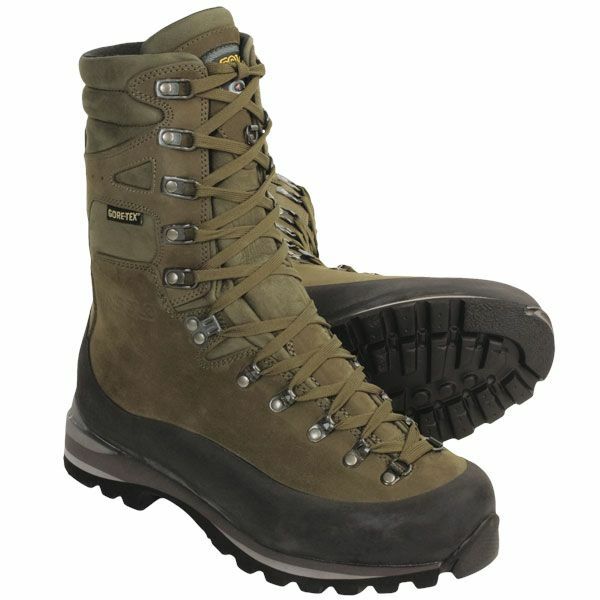 Heavy-duty leather, Gore-Tex backpacking boots – great stability and support… Those are the boots I sprained my ankle in, so I thought I should consider something with more ankle support for when I’m able to get back up on the hill. We were looking for dress shirts (of all things) at Sierra Trading Post a few days ago and there was one pair of these Asolo “military” boots on the bargain shelf, and it was my size. They fit like a glove, and are not too heavy, have a great Vibram sole, a rubber rock guard the whole way around, and are Gore-Tex. I can’t wait to try them. Anyone who hunts chukar knows that the better shape you’re in the more fun you’ll have and the more birds you’ll see. There’s nothing worse than seeing your hard-working dog point high above you and dreading the gut-wrenching, time-sensitive climb up to him while worrying the birds will break before you can get there. You have no choice, and the faster you get there the better. If you’re out of shape, you won’t make it and will be treated to a lovely display of chukar aerodynamics and bird dog aggravation. If you’re out of shape, chukar hunting will get you in shape if you don’t kill yourself first. I like to start the season in the best shape I can be in, and try to make sure my dog is in good shape, too. In the warmer days of late September and October (seems like it’s staying warmer later and later in the season as the years pass), I am usually drenched by the time I reach the first ridgetop, no matter how fit I am. But my lungs work better and my heart and legs are stronger if I’ve been working out a lot during the summer. I trail run and mountain bike in the spring and summer to keep the fat pounds at a minimum and try not to drink too much beer (that’s the hardest part for me during the summer). Having a bad ankle sprain makes it tough to stay in shape, but right now I ride my bike on a trainer inside and get some good cardio work that way. As I get older and feel more creaks, aches and pains, I’ve found that doing some basic core strength exercises helps my body work better and my mind have more fun when I put it to the test when looking for chukar. What's next, boss? Let's go! If you’re on the DL and can’t hunt, or it’s that horrible 8-month stretch when you can’t do any real hunting, don’t forget to work and bond with your partner. If you like your dog and appreciate what he or she does for you, make sure you keep that momentum going when you’re not hunting. Your dog is much better at hunting than you are; all you really do is capitalize on the dog’s work. Sure, you feed him and take him to the vet, but he needs a lot of stimulation and exercise to keep his mind sharp and his body fit. I’m sure I’m preaching to the choir, but I have seen more examples of neglected dogs during the non-hunting season than I’d like. Friendship is a two-way street, and we have a responsibility to keep our end of the bargain with our best friend year ’round. Dig the blog! Just got a gun to start chukar hunting for next season in the Eastern Sierras. My dog is a German sh… epherd mix. Should be interesting. I’ll keep these exercises in mind for prep this year. Recently stumbled onto your blog and am really enjoying the reading and the photos. Kudos to your wife for capturing the shots she has. I’m looking forward to chasing the devil birds in the coming weekends now that the weather’s cooled off. Dog should be ready to go. He put down 35 miles after pheasant & quail over the past weekend and that was with a shortened second day hunt. Dog DID NOT want to stop. That’s a sweet looking Pinarello. Did you race it over there in Idaho? I spent 10 years road racing after turning 40. Man what a lot of fun. Served me well for elk season every Fall. Looking forward to hearing you’re finding birds finally. Thanks for the nice comment, Jim. Where do you hunt? What type of Ever-ready dog do you use? 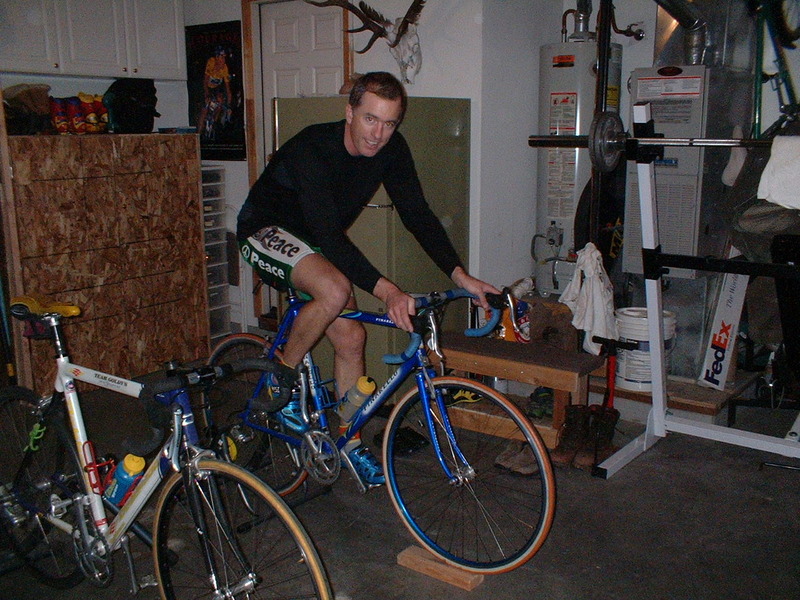 The Pinarello was my first “road” bike, even though it was actually a cyclocross bike. My wife raced from the early ’90s and got me into it. We both quit a few years ago because it took way too much time away from less horrible things! For the past 20 years I’ve mostly hunted in the Tri-Cities area. 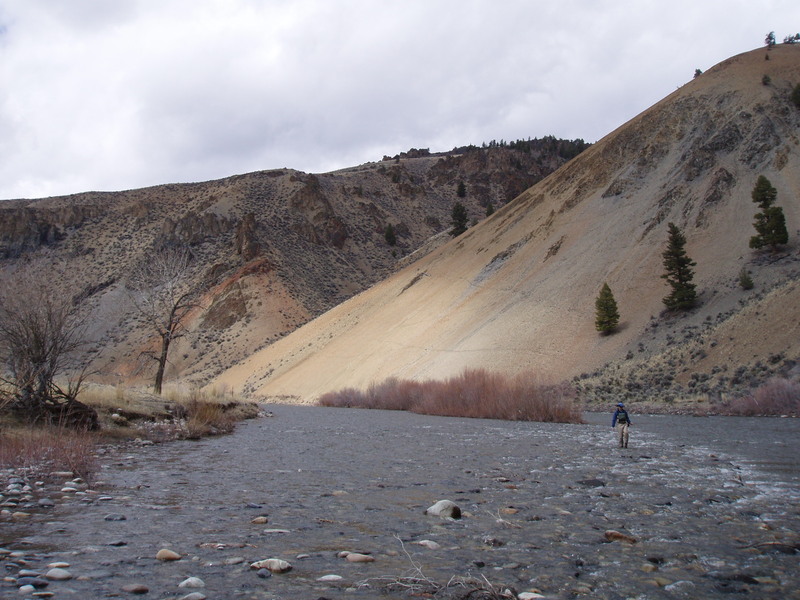 Almost exclusively pheasant & quail, stumbling into the occasional chukar on some of the steeper slopes along the Columbia we used to hunt. I too have a Britt. He’s got a great nose, huge prey drive and love his intensity when he’s on point. 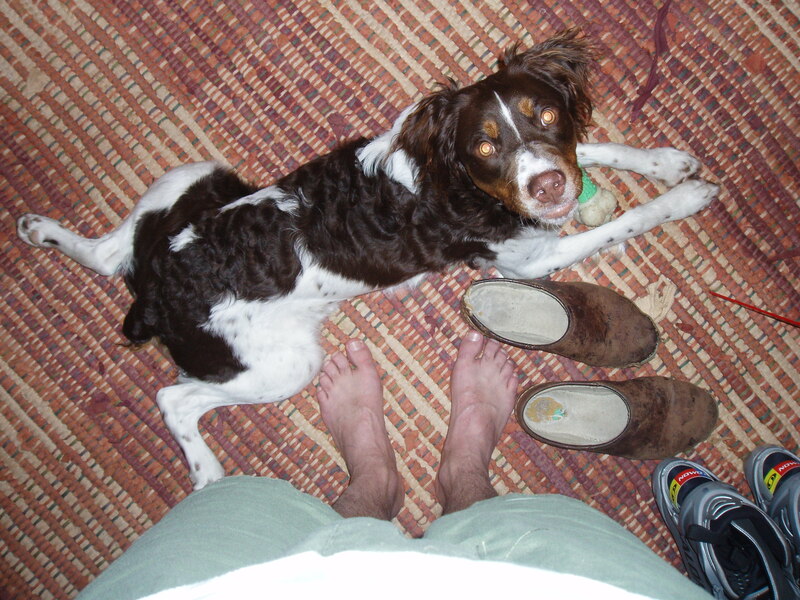 But there are times when he’s almost too much dog…….. he runs big and I’ve had some frustrating moments in the past few years……though he’s getting much better at checking in as he matures. I haven’t hunted chukar for years because I couldn’t find anyone to go with me. Guys I approached either weren’t in shape or didin’t want to work that hard. I used to do all sorts of solo backcountry trips, but have found my desire to put myself at risk alone to have waned since having a family. Ironic as I started racing bikes at 40 and did so for 10 years. If banging handlebars around sharp corners at 25 miles an hour with 60-100 other guys isn”t risky, maybe it’s just a little crazy. But the difference is I knew there was always medical help nearby if needed. Unlike some of the high, lonely places where those birds thrive. Have found a couple of prospects to hunt with so I’m looking forward to it.